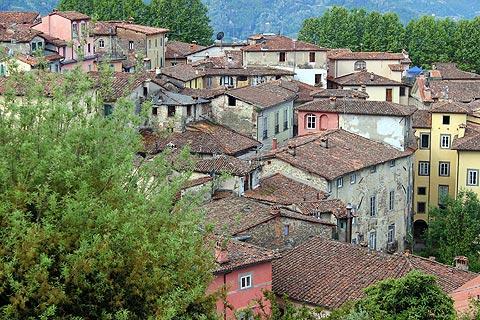 Barga is a small town on the Serchio river, in the Garfagnana region about 30 kilometres north of Lucca. 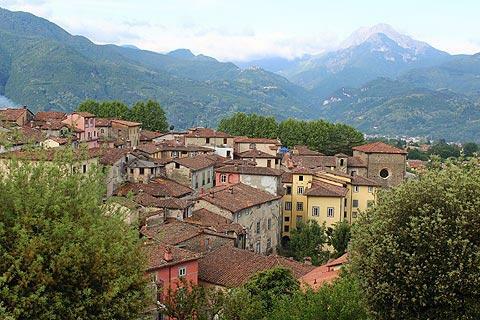 Italy This Way comment: the setting of the town surrounded by mountains and the charm of Barga old town centre - which is quite extensive - combine to make this a very lovely town to visit as well as being well placed as a base for walking in and exploring the surrounding Apuan Alps. The old town, still surrounded in part by its original defensive walls, is a quiet region of medieval houses and narrow streets, steep staircases and dark passages with the occasional small piazza and shops. The alleys eventually give way to the open area at the top of Barga where you can see the cathedral. Start your visit by entering the old town through the old gateway called Porta Reale through the defensive walls to the south-west of the town - this is convenient because there is a car park just outside the walls in Piazzale del Fosso (so called because the fosse, or moat, used to be here) and a larger car park just down the hill. 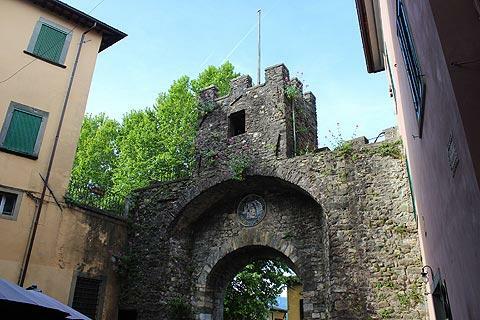 The other ancient gateways, Porta Macchiaia and Via di Borgo, can also be seen as you explore. The Porta Reale gateway leads you straight on to Via di Mezzo, a narrow street with numerous attractive buildings that passes all the way through the heart of the old town. En route you cross a couple of small piazzas before reaching Piazza Garibaldi where you can visit the Barga Tourist Office and collect a map of the town. This is quite useful because the town follows a very irregular layout and there are numerous small alleys and staircases and various monuments and sights of interest that you might otherwise not find. 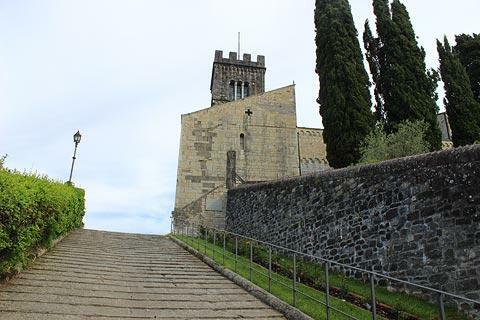 Sooner or later you will climb one of the steep staircases or alleys that lead to the highest - and oldest - part of the town where you can see the cathedral. The views from the terrace area in front of the cathedral are especially impressive and extend well into across the Appennine and Apuan Alps mountains of the region: these might be bathed in endless blue sunshine or surrounded by menacing clouds but both are equally attractive! Just below the cathedral in Barga there was very nicely maintained French style garden - but it is privately owned so you will have to make do with peering over the wall and through the gate if you want to see it! Dedicated to Saint Christopher, Barga cathedral dates from the year 998 AD and the following two centuries, and although modified several times across the following few centuries it has retained a significant part of its original romanesque architecture - although this also suffered slightly at the beginning of the 20th century when the church was rebuilt after being very damaged by an earthquake. The facade, among the oldest parts of the building, was actually the side of an earlier version of the cathedral. In keeping with rural architecture of that time it is quite an austere cathedral with little in the way of windows or decorative elements except for the stonework around the entrance door with two carved lion heads, two discrete rows of carvings higher up the facade and a tall square belltower. The doorway to the left side of the cathedral also has a 12th century relief carving. One of the main highlights inside the cathedral, which is rather plain in appearance, is the carved stone pulpit dating from the 12th century and supported by marble columns that in turn are suported by statues of animals and an old man. The reliefs on the pulpit itself represent stories from the Bible such as the Adoration of the Magi and the Nativity. 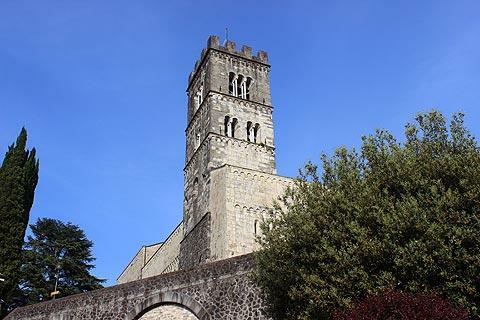 Other notable artefacts in Barga cathedral include a colourful 12th century statue of Saint Christopher and various other paintings and artworks from the 15th and 16th century. 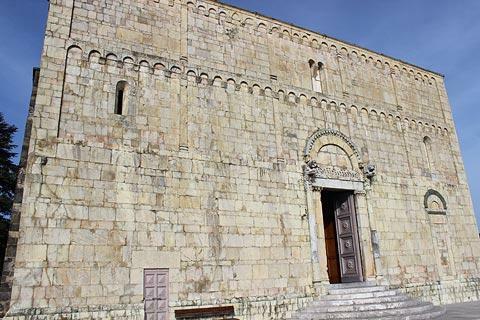 The stone building next to the cathedral called Palazzo Pretorio is also very ancient, having been built in the 12th century, and now holds the town Civic Museum. The small church just down the hill from the cathedral also has very early origins having been built in the 12th century, but a 17th century reconstruction conceals these origins and the current structure is baroque in appearance with four stone pilasters in the facade. The statues set in niches in the facade represent Saint John and Saint Catherine. Inside, the church has a nave, two aisles and a barrel vault and stucco decoration. Most of the important buildings in the lower part of the town date from the 16th - 18th centuries and include the Town Hall in Palazzo Pancrazi; the 18th century Palzzo Mordini which now holds important documents relating to Italian Unification (the Risorgimento) from the 19th century; and the Teatro dei Differenti. Apart from the cathedral most of the monuments are relatively minor, and it is the ambiance of the town and its small squares surrounded by cafes and attractive houses that are the principal attraction. Other notable monuments here include a 14th century loggia, and the Church of San Francesco which contains paintings by the well known renaissance artist and sculptor called Andrea della Robbia. Returning to Via di Mezzo, one place of particular interest that we enjoyed visiting was Casa Cordati. Free to enter, this imposing palazzo was once the studio of a well known local artist called Bruno Cordati (1890-1979) and now features an extensive gallery of his artworks as well as some by more contemporary artists. Barga has gained a good reputation for its annual music festivals held every summer. 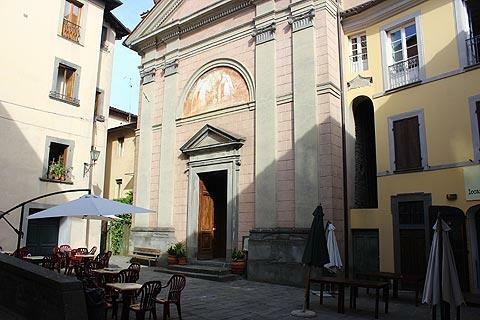 There are various different festivals held here to cater to a variety of musical interests, with jass the most popular - the Barga Jazz club is open all year round if you can't visit during the festival period and is perhaps THE major attraction for visitors to Barga. 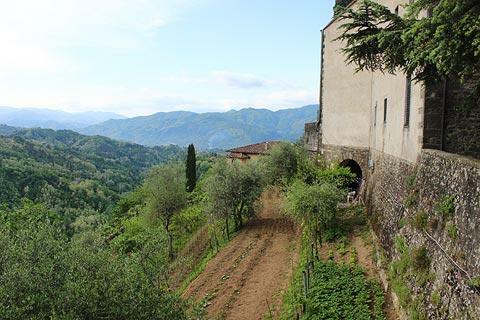 The slow pace of life continues with the food here - there are several restaurants and Barga is officially listed as a 'Slow Food' city, part of a network of towns that encourage restaurants to serve quality food sourced locally where possible. 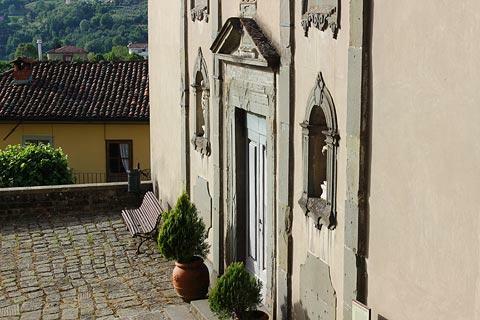 Barga is well placed to explore the natural environment and mountains of the Garfagnana region of northern Tuscany. 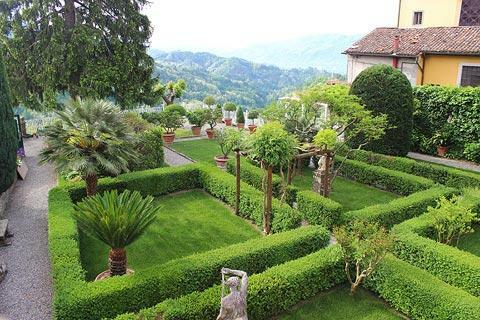 It is between Bagni di Lucca to the south and Castelnuovo di Garfagnana to the north-west - Bagni in particular has several points of interest and merits to be explored during your visit.